I was planning to bake bread, since long, but because of the tight schedule, that was pending. 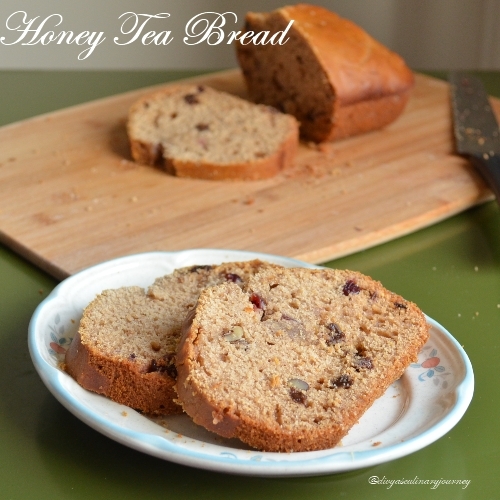 I was browsing for inspiration and came across this Honey tea Bread, made a few changes and baked. 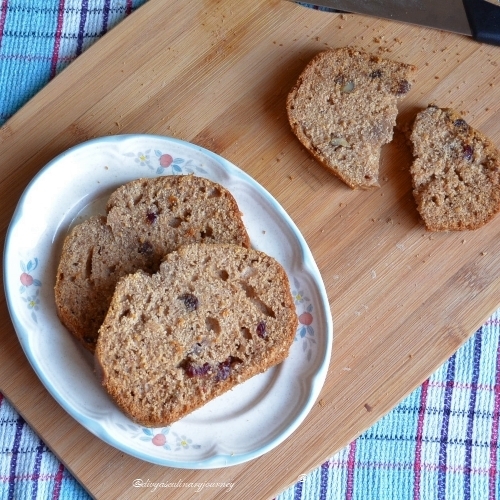 It is a quick bread, soft, has got a mild taste of tea and is sweetened with honey. Perfect to serve with Tea or even breakfast. Prepare the loaf pan by greasing and flouring it and set aside. In a large bowl, combine flour, baking powder, baking soda, cinnamon powder and salt. In another bowl combine milk and tea and beat in the egg, honey, vanilla extract and oil. Add this mixture to the flour mixture and gently mix them. Finally fold in the dried fruits, nuts and grated ginger till they are fully incorporated. Pour the batter to the prepared pan and bake for 45- 50 minutes, till the fork inserted in the centre comes out clean. Remove from the oven, let it cool for 10 minutes and remove from the pan. Let it cool completely before slicing them. That's really very innovative one Divya..very nice.. Interesting and innovative recipe Divya. Perfectly made. Adding tea to bread is new to me...Interesting..Looks soft and delicious.. interesting! !..loved this version of bread...instead of having chai and toast ..u have just chai wala bread ka toast!!..lovely. Even i want to make bread with tea since a long, somehow couldnt able to make it, you are here with a beautiful bread, cant wait to try Divya. wow... bread looks delicious... and looks like there is no yeast as well.. hence no need to wait till the dough doubles... A must try!! very intersting and healthy bread... looks perfet! tea bread is new to me.must be aromatic.looks delicious . This tea bread looks delicious lot of flavor. Love the flavour combination going on here. The addition of ginger surely gives it a masala chai kinda twist. Lovely bake. Very interesting n innovative....Awesome recipe! Delicious n flavorful bread, looks so soft n yummy. Perfectly baked bread. Interesting addition of tea flavor. love the tea flavor in breads!